I’ve been fortunate enough to attend AOTA’s Annual Conference for four years in a row now, and this year’s Centennial (#AOTA17) was my first year attending as an official OT practitioner! There were about 13,000 attendees in Philadelphia this year, and it was truly an amazing experience. I was able to present an AOTA-sponsored session with my Emerging Leaders mentor, deepen friendships with my Emerging Leader cohort, develop skills in my new practice area, and learn about cool things happening in the world of OT. I had a great time and I was sad to finally leave Philly, although I was SO ready to sleep in my own bed again! Still, in the week that I’ve been home, I’ve been making an effort to keep all of the OT energy from Conference going strong! By this time all the Conference attendees have headed home and everybody has likely settled back into their daily grind. And while you may not be attending any fun educational sessions, dance parties, or networking events in the near future, there are several ways you can continue making the most of your conference experience even after you’ve returned home. During my observations and on my OT fieldworks, there are always clients who don’t want to do therapy. They come in all shapes, sizes, and ages, and trying to get them to participate in treatment can be like pulling teeth. It seems like no matter what you say or what you do, they are determined to remain in bed or in their rooms. Earlier this summer I was working with a 93 year old woman in a SNF. She had a severe cough that racked her body as she lay in her hospital bed, complaining of various aches and pains. When I first asked if she would come to the therapy gym for an occupational therapy session “to build up her strength,” she refused to get out of bed and said repeatedly that she didn’t feel well. After a few minutes of my coaxing and her refusal, I was going to just give up. But then, in an effort to simply get her talking (and with the hopes of leading the conversation in a therapy-related direction) I started asking her questions about what she did for a living. It turns out that she had been a hairdresser for over half of her life, and that she spent almost all of those years standing on her feet and doing hair! Using this new knowledge of a valued occupation as motivation, I asked her if she could stand up for me so we could get to her wheelchair and visit the beauty shop that was just around the corner in the SNF. She agreed, and off we went! This encounter was a lesson in the motivating power of occupation and how introducing meaning into a treatment can take an unsuccessful session in a totally different direction. And while many of the strategies below have been helpful to me as I’ve worked with clients of varying ages and in various settings, it’s important to note that none of them will work if you haven’t laid a good foundation for treatment. Specifically, if you are working toward goals that are not meaningful, relevant, or achievable, you’ll just be wasting your time and theirs. Remember that occupation = motivation. Your goals for a client should always be client-centered and occupation-focused. If you have a hard time getting clients to participate in your treatment sessions, take a look at your goals or intervention approach and revise to ensure that each one focuses on enabling a client to maximize participation in or return to meaningful occupation and incorporates occupation. Hello again! The holiday season has come and gone, and we have officially entered that time of year when people are pinching pennies, making resolutions to save, and crossing their fingers in hopes that they’ll get a tax refund and not owe anything back! If any of these scenarios rings true for you, you’ll be excited to learn that you can honor your resolutions and save a few bucks by spending absolutely nothing to access these free magazines with helpful articles, job postings, and information for OT students and practitioners! Below is a selection of six free publications that OT/As can read for treatment ideas, discussion of professional issues, product recommendations, and more! Even if you are a dedicated reader of AOTA’s OT Practice magazine, I recommend signing up to receive digital editions of a few more magazines to help you sharpen practice skills, gain new perspectives on the profession, and improve your interactions with clients and families. Read on to find out what’s free for those who practice OT! 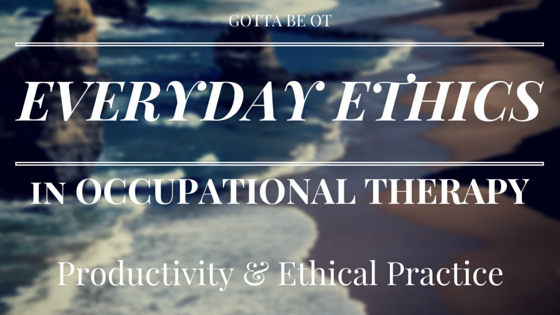 This is Part II of a two-part mini series on ethics in OT practice. This post discusses productivity requirements and how they impact practice for OTs and other rehabilitation professionals both in and out of the workplace. Click here to read Part I, about my experiences with ethics as a FWII student. In my current vocational rehabilitation (VR) fieldwork setting, the VR counselors and others have productivity standards measured by how many cases they successfully close, which is typically defined as clients becoming employed. Although right now I am working in a non-traditional setting, there is a much larger discussion taking place about ethics as they relate to productivity standards in the rehabilitation and skilled nursing facility (SNF) settings where a large percentage of OT/As work. The argument being made by professionals in several different fields, including PT, OT, and SLP, is that the extremely high productivity standards to which they are being held takes an extremely negative toll on the quality of care they are able to provide, as well as placing them in ethically compromising situations. The ongoing issue of productivity as it relates to ethics sheds some light on a grim reality of occupational therapy practice that students, new grads, and others may not be aware of as they enter the profession and begin practicing. After my initial FWI experiences in a large teaching hospital and outpatient pediatric clinic last fall, I became very aware of the pressure put on therapists to see 8-10 patients – and complete documentation, attend meetings, and coordinate case services – during the workday in order to meet unrealistic standards of 75-90% productivity. It was a sad reality check, seeing the “dark side” of the fun sessions and client interactions I observed that initially drew me to OT. However, now that I have been in OT school for over a year and seen all sides of the therapy process, I’m coming to realize that it’s not all sunshine and successful sessions.